According to the link  I have submitted my share of code in OAE project on . Please let me know if you expect anything else. Also, Ian I am so much grateful to you, you have no idea! Thanks a lot for passing me in final evaluations 🙂 It really wouldn’t have been possible without your continuous support and confidence in me. Open source world, though awesome, was really a bit intimidating. But it was because of your gentle attitude and kind understanding that I was able to come this way! I have learnt SO many thing from you and I am so grateful! I can just go on, but I know each passing minute costs you a lot! But lastly and again a big thanks! I will try my best to fulfill yours and Amyas’s wishes. It has been an awesome experience working with you! I will try my best to stay in touch with you and try to contribute as much as I can if you wish! He deserved to pass with flying colors. Well done Aadish. Normally I would announce this sort of thing on a mailing list, but I dont have one, so this is the next best thing. SparseMapContent v1.0 has just been released. Its a project I started almost 12 months ago to enable Sakai OAE to store user generated content in shallow wide hierarchies, where 1000s of users would be performing updates, potentially served by an elastic cluster. It stores its content in a simple key value store with rdbms storage on Derby, MySQL, Oracle, PostgreSQL or column storage on Apache Cassandra or Apache HBase. In addition there are both bitstream stores for shared filesystem or as blocks within the the underlying column database. It comes bundled as an OSGi bundle intended to work with Apache Sling. Released with SpraseMapContent is a Solr bundle based on a Snapshot of Solr 4, intended to provide a free text and keyword index for the content stored in SparseMapContent. That bundle maintains a persistent queue of pointers to content to be indexed filled by OSGi events, and indexer framework that resolves the pointers and indexes the content including metadata, and a search index. This bundle is also used by Sakai OAE, although like the SparseMapContent bundle it could be used by any application wanting to maintain a Solr index from an event stream. If you dont like the names, neither do I and suggestions are welcome. Thank you to all those who have made contributions over the past 12 months. “Although it may be tempting to think of social institutions as functioning like organs, human societies behave, in practice, much more like slime molds. They don’t have eyes or brains that are anything like human eyes and brains. So although any one of us can learn from our mistakes, foresee problems and act reasonably to solve them, collectively we don’t do a very good job of this. We have been working hard on IMS-CP at Cambridge. I should qualify that, Yushan Li from Tsinghua University who has been at Caret for the past month has been working hard on implementing IMS-CP import, and I have been causing trouble for him. Still, we have a working implementation of IMS-CP import that is in our “production” branch. It takes an IMS-CP file and during upload, unpacks the Zip file and converts the IMS Manifest into a Sakai Doc structure definition, so that the IMS-CP appears as a Multilevel Sakai Doc within the user library. They can still get to the original Zip file if they want to download it, and they can also use the Sakai Doc anywhere they can use any other Sakai Doc created inside OAE. Resources within the IMS-CP are also unpacked so that relative URLS within pages of the IMS-CP continue to work correctly. 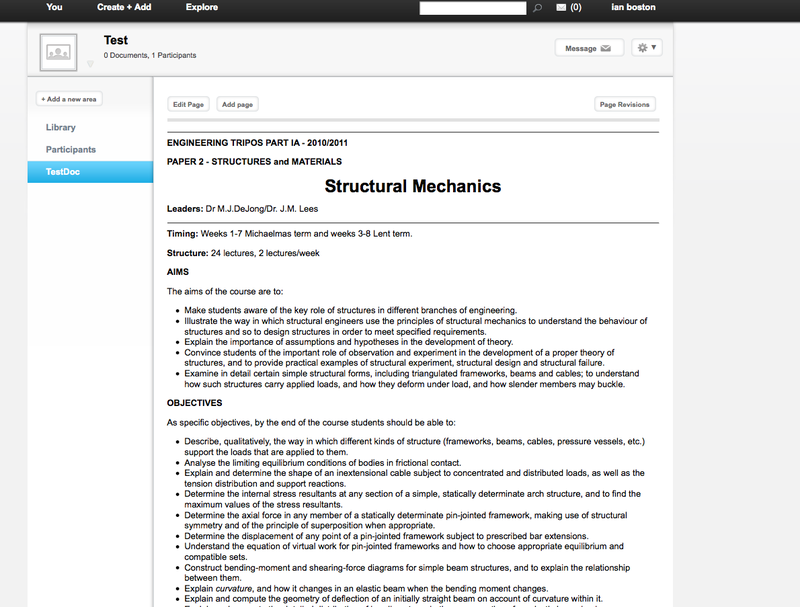 To test this we have been using sample files created by Charles Sturt University from the Sakai CLE Melete Tool. Yushan’s graduate studies have including contributing to the new Metadata for Learning Resources standard and working closely with IEEE LOM, so there is now support for IEEE LOM within OAE at Cambridge and we handle some of the cases where the Melete tool exports diverge from the IMS-CP standard. 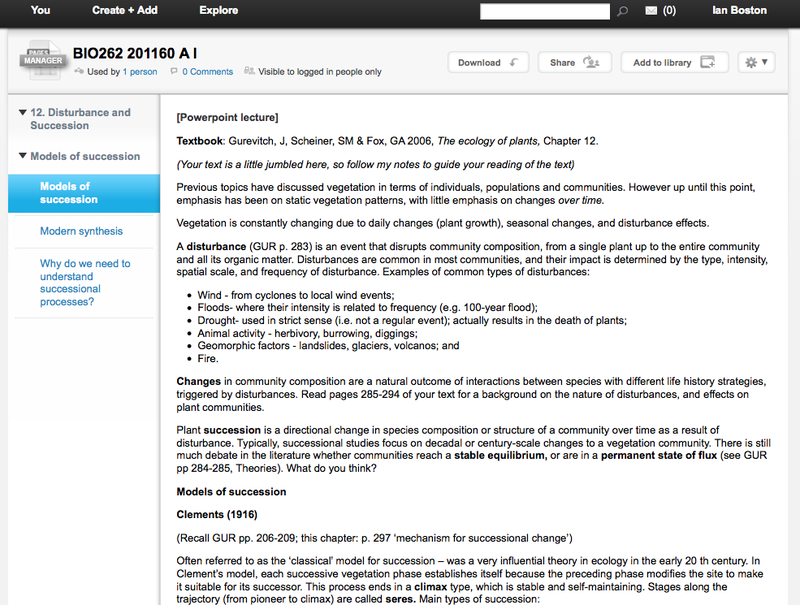 The following Screen shots show the functionality in action, uploading a content package which is converted on the fly into a Sakai Doc and then re-using that Sakai Doc in a Group. 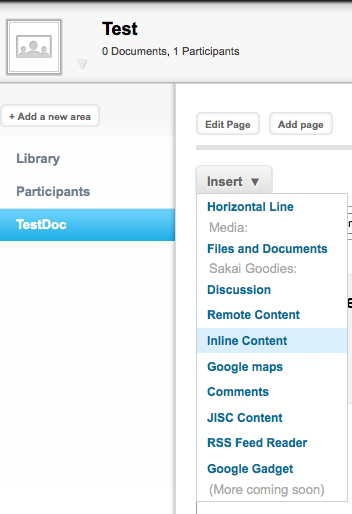 The main modification to the Sakai OAE code base is to deep levels of nesting within a Sakai Doc. Previously Sakai Docs could not nest more than one level deep. We hope to be adding IMS-CP export shortly, and then moving on to IMS-CC Import and Export. All of these features have been on the Nakamura Roadmap for almost two years now so is nice to see them being implemented, and we are very fortunate to have someone as knowledgable as Yushan doing this work. 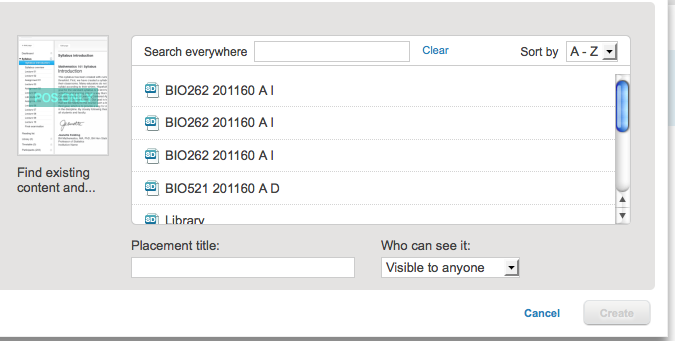 The IMS-CP file appears in the Library as a Sakai Doc ready for use. 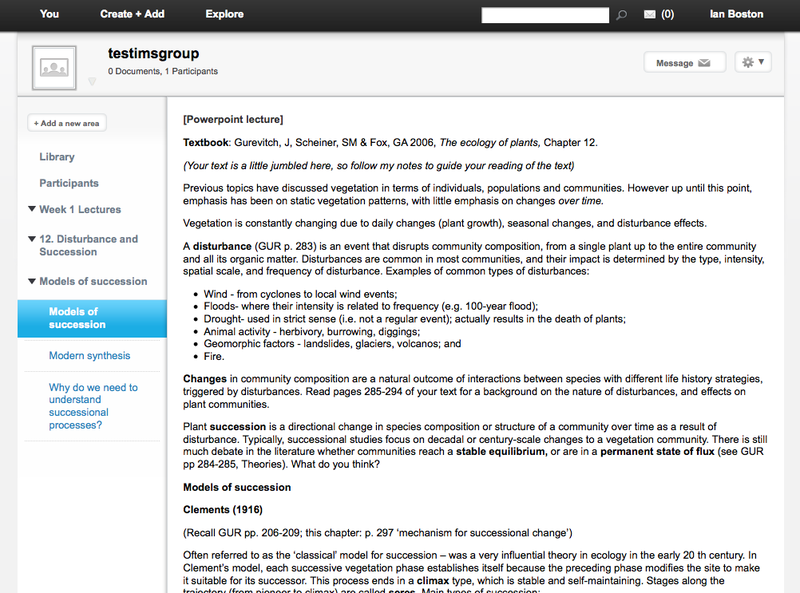 The following sequence of screenshots shows a Sakai Doc being created in a Group, then the inline content widget being added and configured to inline the Lecture information in question. Select the year and paper to be displayed, from a set of configured papers. Verify that the paper is correct from the preview that is presented. The Configured widget appears as an Icon in edit mode. 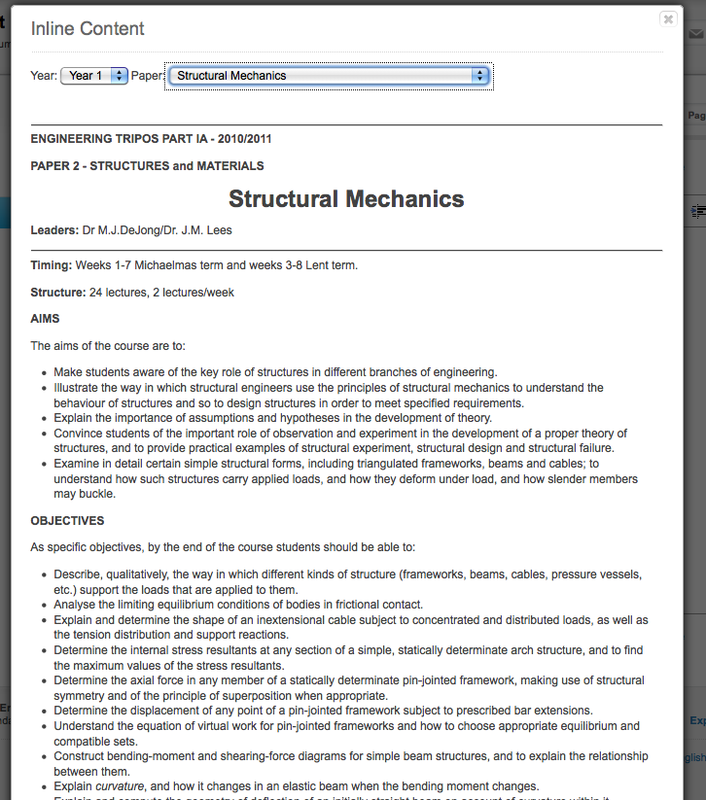 Saved page contains the Page from the Year 1 Syllabus fetched from the Engineering Department Teaching pages. Cambridge OAE: Accept Terms and Conditions Widget. 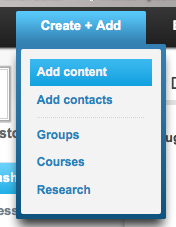 For the University of Cambridge OAE instance we have an “Accept Terms and Conditions Widget”. This is loaded as a widget on all pages and checks that the user has accepted the current terms and conditions. I they have not, it pulls their official identity from the institutional LDAP, and asks them a) do you accept the terms and conditions and b) are these the details that should be used. The wording of the terms and conditions is being reviewed by the lawyers at the moment, and can be internationalized as required. Development took about 4 hours, start to end and it uses most of the Sakai Widgets API. 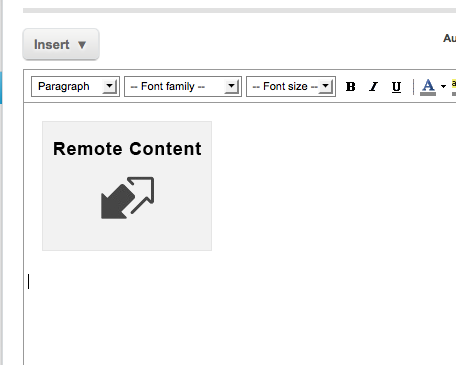 There is one small patch to the core code base to ensure that a div appears on every page to load the widget. Code is in the Cambridge OAE extension repositories https://github.com/ieb/ucamux , https://github.com/ieb/ucamex and is deployed as separate jars into instance. Comments : Comments Off on Cambridge OAE: Accept Terms and Conditions Widget.